You’ll finally be able to connect between two concourses at Miami International Airport without a need to go through security. 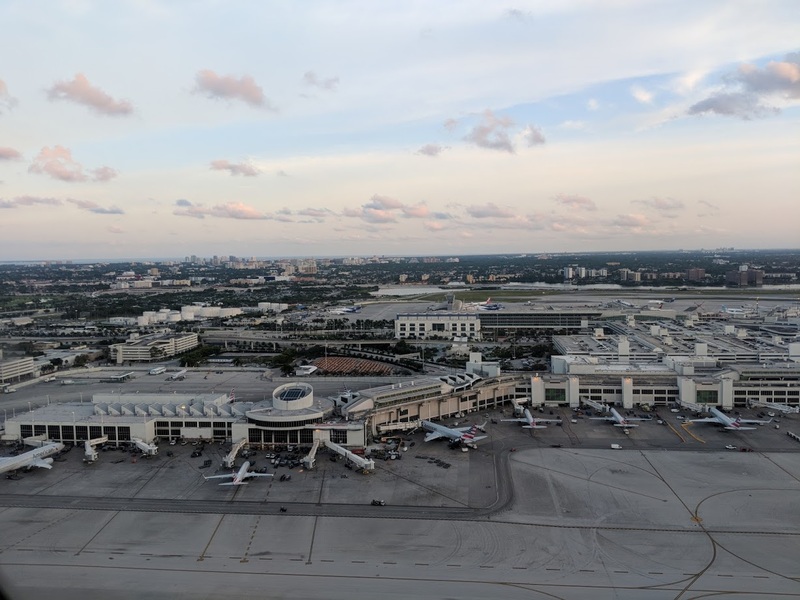 A $17 million pedestrian bridge is in the works to connect Concourse E And F at the airport post security, according to a joint participation agreement with the Florida Department of Transportation, which is funding half of the construction cost. The new bridge could eventually allow American Airlines to further expand at the airport, by allowing passengers to walk to and from Concourse D and E, where American operates from, to Concourse F without needing to reclear security. Concourse F is still not connected to Concourses G, H, or J post security, however. The $17m bridge is only temporary. Eventually, the airport plans to demolish the Central Terminal (including Concourses E, F and G) and replace it with an entirely new terminal, including a full connection to both North and South Terminals. $300M metro extensions sound so much but then you discover these fairly frequent $20M temporary purchases. Wouldn’t it save money in the long term by eliminating a checkpoint? Agreed, it needs to be done but why not just fast track the planned central terminal reconstruction? It just seems a waste to spend 30 million on something that won’t be operational for another 18 months at the very least and then will be demolished just two years after that. If this is the best planners could figure out then i can’t wait to see how the central term construction plays itself out. Hopefully they’ll employ the same people who are doing La Guardia which seems to be getting done without any hiccups and minimal (if you can call demolition and rebuilding of all your terminals minimal) disruption. The re-do of Central terminal should be a show piece for Miami, but as usual it will probably be penny pinched and reduced to below average. Can’t disagree, but at best it’s a band-aid on a gaping flesh wound. MIA is horribly backwards, and an embarassment for a city as international as Miami. As another poster mentioned, fast-track the rebuild. Time and money spent fixing existing facilities is wasted. One of the reasons we weren’t competitive for the Amazon HQ was a lack of public transit. MIA is absolutely a huge economic engine, but it’s short sighted to just support one engine with no plans for long-term economic diversification that only happens when you’re competitive on quality of life metrics like transit mobility. Has anyone ever seen a Master Plan for whatever MIA is strategically planning? Their website: http://www.iflymia.com is conspicuously devoid of such info. They published their Central Terminal Presentation last year. MDA is still working out financing. Why is E being renovated? This makes no sense. A Waste? Maybe so. But DESPERATELY NEEDED! If you are a user of MIA, the fact that you can only move between D/E or H/J is a royal pain. And if MIA is to add revenue so that it can afford the full Central Term rebuild–they’re going to need to fill those terminals with more frequent flights… and if AA wants to… then they need the bridge. Gotta spend $ to make $$. The broken Banana Republic of Miami Dade has made so many errors in the past the borrowing capabilities are quite expensive, from what I’ve read–it has a low rating = high interest! Eventually FL’s 2nd busiest airport will be “world-class” from D1 to J18. (and lose the third-world Terms E-F-G!) Maybe someday the TRAAM will run the airport like DFW’s SkyLink! So fill the terminals with flights so they can tear them down and build a new one? Not sure, but I think something is out of order in that sequence. MIA is not going to be able to fill a 40 year old terminal with flights. I hope the Central Terminal isn’t rebuilt, because it’ll probably be by Arquitectonica and a monstrosity.